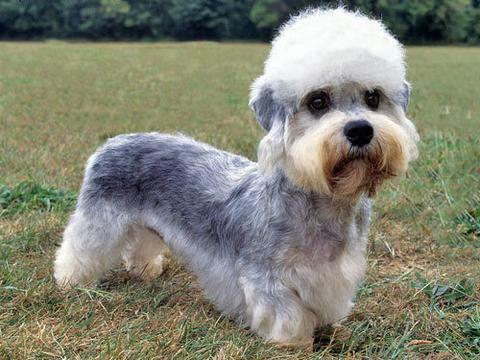 A Dandie Dinmont Terrier is a small Scottish dog breed in the terrier family. The breed has a very long body, short legs, and a distinctive topknot of hair on the head. They are friendly but tough, and are suitable for interaction with older children. In the 1600s they were used for hunting otters and badgers. Dandies are typical terriers: independent, bold, tenacious, and intelligent. With people they know, they’re affectionate yet dignified but tend to be reserved with strangers. Because Dandies are reserved dogs, they are not “barkers," as are most of their terrier cousins. Dandies will bark when necessary, and their bark is deep and loud. They just don’t seem to think it’s proper to keep barking after the alarm has been duly noted or to bark just to hear their own voices.Like most terriers, Dandies have a great deal of self-confidence. They are not high-strung as are many terriers, however. Nor do they seem to be out looking for a fight, as many terriers do. Dandies are never bullies, but they won’t back down if they are pushed too far.